I’m happy to say that our marriage is in a much stronger place now than it was then, although not without its problems. So, this Valentine’s Day will be easier than the one I previously described. However, I know so many of you wives out there are hurting, too. How do I know? Because the number one searched word that leads people to this blog is the word “unloved” from a post I wrote way back in 2013. Since then, I’ve been contacted by so many Christian wives who truly desire to walk in obedience to the Lord even in the midst of marriage problems, but they just aren’t sure how. I have been that wife myself! 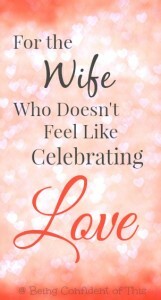 So, if you find yourself in a marriage that just plain stinks this Valentine’s Day (or birthday, anniversary, Christmas, whatever you happen to be celebrating) – if you believe you can’t show love because you feel so unloved – I have some advice for you that comes from my personal experience as a struggling wife. 1. Remember who you are in Christ. This has been key for me in overcoming lies from the Enemy about my marriage. In Christ, I am completely and perfectly fulfilled. I am perfectly loved. I am wanted. I am cherished. I am chosen. Any loving that I do, has to flow from that place of understanding who I am as a Daughter of the King and Christ’s Bride. 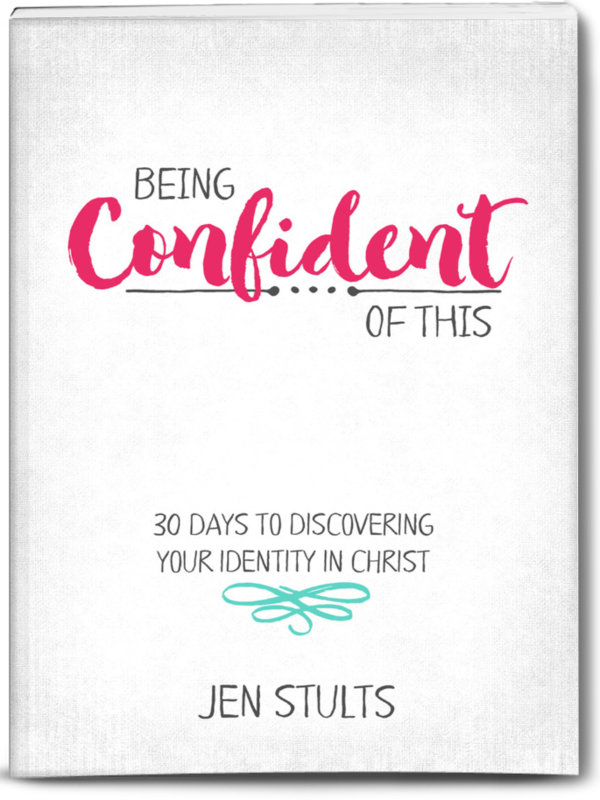 When I find my identity in Christ instead of in my marriage, then I can survive the tough times. 2. Pray. Pray without ceasing that the Lord will give you His unfailing love for your man. I can’t tell you how often I’ve begged this of our Father over the years. That agape love comes not from us, my sisters in Christ. Rather, it is an overflow of abiding in the One who IS perfect Love. Pray for your man, as well, that he will demonstrate love to you in return. The Lord can affect changes in his heart that you can never hope to make! 3. Seek counsel. My husband and I might face the effects of PTSD on our marriage for the rest of our lives. I pray not, but it could be so. We’ve found a few godly friends who really “get” us and even more importantly, “get” our marriage dynamic. They understand because they’ve been there, too. However, I highly recommend seeking out a godly Christian counselor. We’ve been through several over our nearly 16 years of marriage. Our current counselor is by far my favorite. He doesn’t downplay the reality of PTSD as some do, neither does he downplay the power of Christ. He brings scripture into our sessions and ends each one with a prayer that brings encouragement to our hearts. My friends, there is an indescribable comfort in realizing that your marriage problems are not unique. Others have faced them and overcome them before! You are not alone as the Enemy would have you believe. Seek help! And if your man won’t go with you, please don’t use that as an excuse not to get help for yourself. 4. Make a list. Sometimes when I’m really struggling to love my husband, I make a list. I take note of all of the things I admire about him – all of the reasons for loving who he is as a person. This really helps me to turn my focus from the negative, things I dislike, to the positive, things I like. It also helps me to look back and see the ways in which he has grown over the years. After all, he is a work-in-progress, just as I am. Remembering that fact helps me to show him more grace and love. 5. Read your old journals or love notes. Every once in a great while, I pull out my memory box and look through pictures or keepsakes from the early years. I read the notes my husband wrote to me. It’s easier to love someone when I remember that he loves me, too! The memory box also helps me to remember how marriage can be easy between us. It doesn’t always have to be a struggle (that’s another lie straight from the Enemy, sisters!). Good years will return as long as we both continue to follow the Lord and pursue each other. I know how difficult the above advice is to hear when you’re so broken-hearted, so wounded, so unloved. Yes, I know it is. But I have faith in the God who works out the impossible! 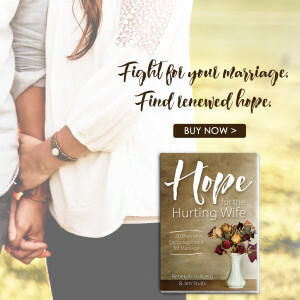 I’ve seen it in my own marriage in places where the Father has torn down our shabby constructs of love in order to build up newer, stronger foundations that rest on Him alone. I believe Him when he says I can do ALL things through His strength – even loving someone whom I might believe to be undeserving of my love. I can love someone who doesn’t love me in return, perhaps even someone who truly despises me at the moment, because of the power of Christ in me. And you can do it, too! 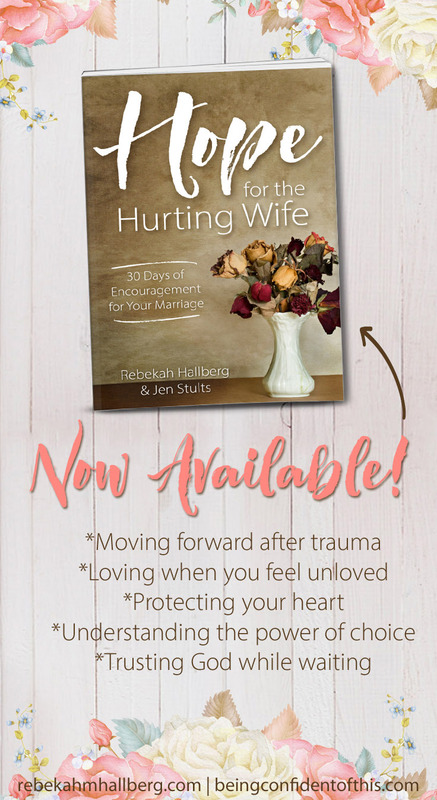 You can celebrate Valentine’s Day without glossing over that fact that your marriage is hurting. You can be honest with your spouse. You can choose to act lovingly toward him even if he is not reciprocating. 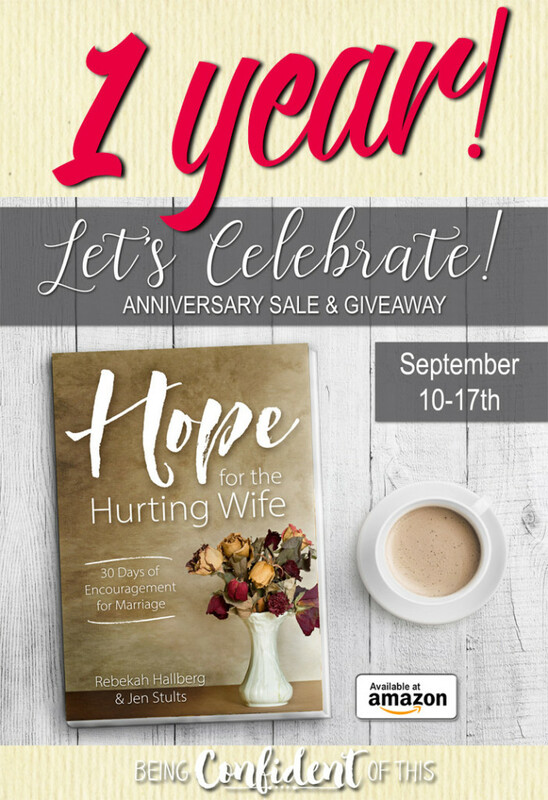 You can cling to the hope that Christ redeems us, and He redeems our marriages, too! You can, my sisters in Christ, because of Jesus. 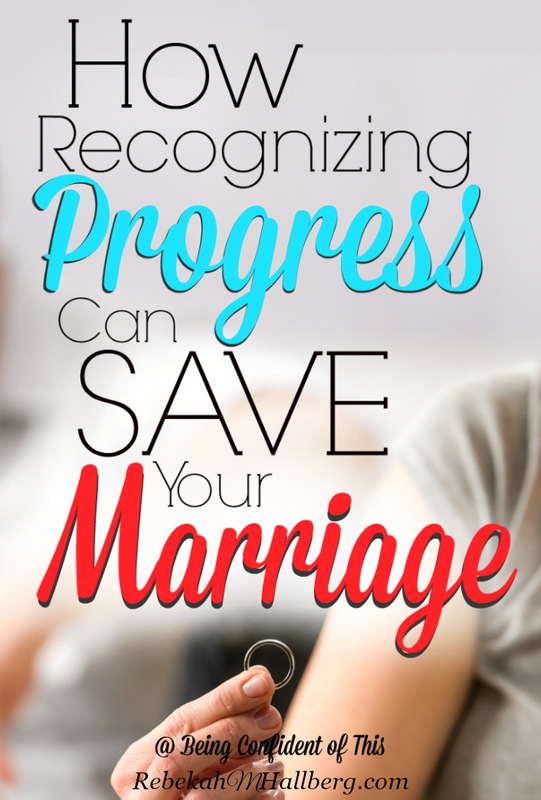 Father, when we feel discouraged in our marriages, when we struggle to speak even a few loving words to our husbands, help us to remember that our marriages are works-in-progress, too. Show us the progress, Lord! 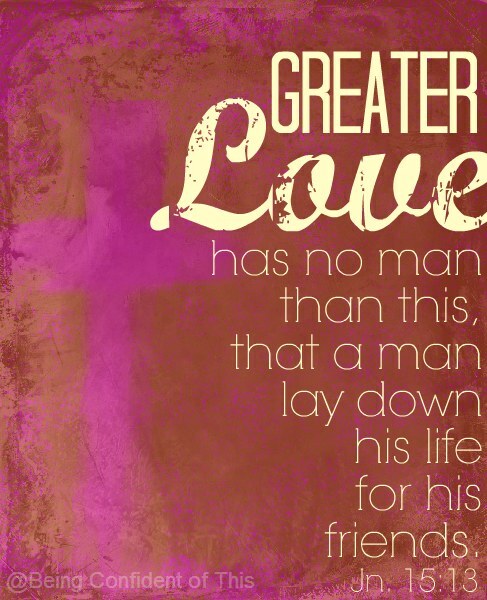 Give us agape love for our husbands so that they might be drawn to us and drawn to You. Remind us to pray for them. Remind us to pursue them. Show us every small way in which we can encourage and uplift them because of Your strength in us. And when we’re feeling so unloved ourselves, help us to turn to You, the Author of perfect Love. Teach us to be satisfied in You. 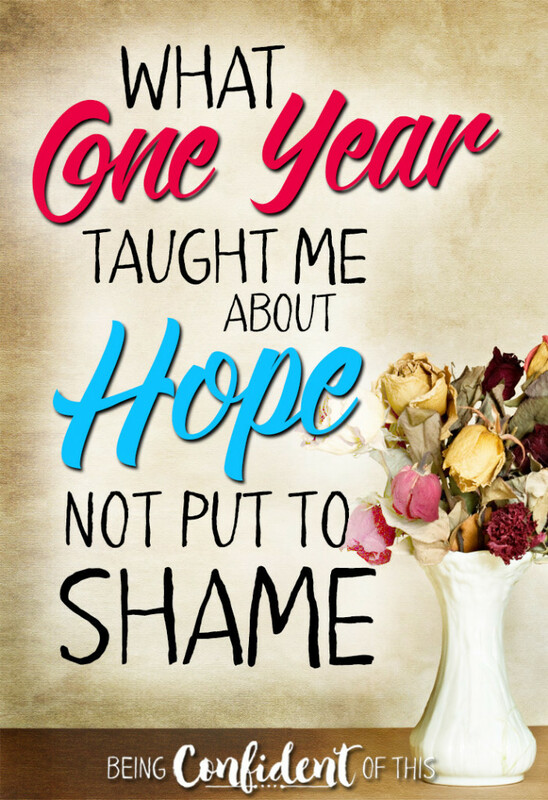 Especially on this Valentine’s Day, I ask you to bind up the brokenhearted and give them Hope! Because of Your one and only Son’s death on our behalf…. *This post makes use of affiliate links. For more information, please visit the Being Confident of This homepage. Thank you for helping to support this blog! ~ You just finished an excerpt from the book Hope for the Hurting Wife by Rebekah Hallberg and Jen Stults, two women who have walked through the valley of troubled marriages and emerged safely on the other side. 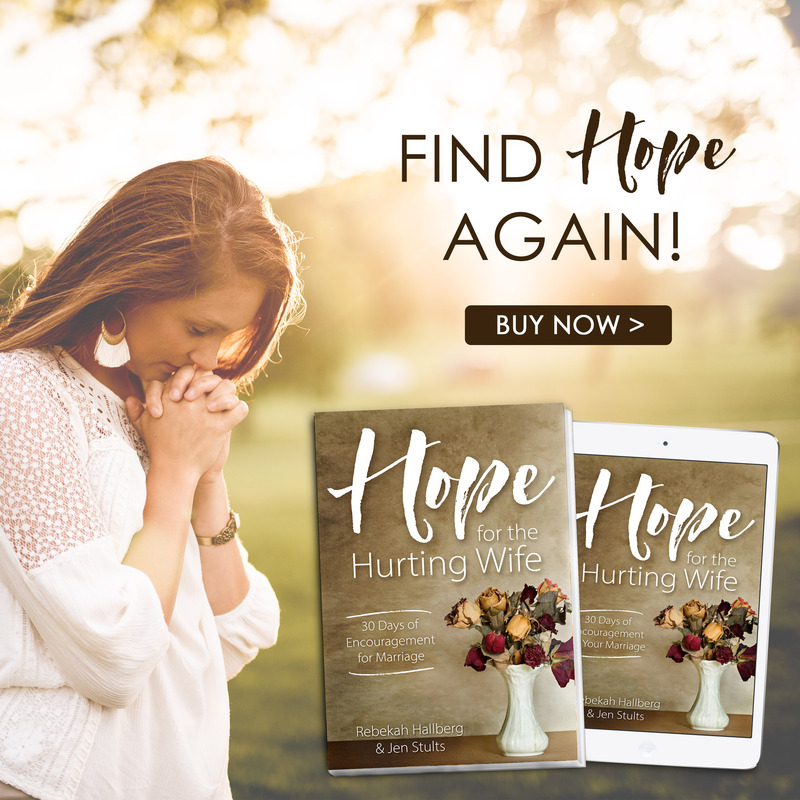 Their testimonies to God’s presence and hope in the midst of difficulty gives hope to wives who are really struggling not to give up! 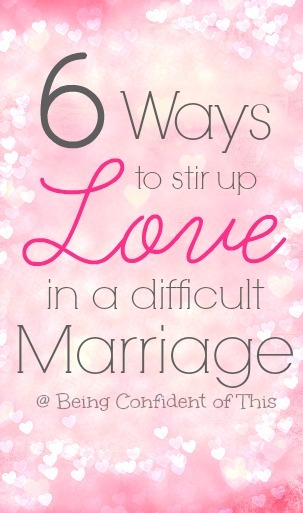 For more encouraging articles on marriage, check out the Celebrating Marriage pinterest board! And with Valentine’s Day just around the corner, your pain is magnified because while everyone else is celebrating love, you’re left wondering where the love has gone. Perhaps you don’t even want to celebrate Valentine’s Day at all? Early on in our marriage, my husband revealed a secret about past trauma that he had kept hidden for years. He had survived things as a child that nearly made me vomit when I heard them, yet he never spoke a word! That revelation (and other difficult circumstances) led to a really dark time in our marriage. After talking with some trusted friends, we finally sought professional help, but it was years later before we learned that my husband really struggled with PTSD (Post-traumatic Stress Disorder). Yes, the kind that soldiers get when they’ve been to war, only his was induced by childhood trauma. At some point, I began to wonder – who is this man that I married? Followed by the thought – this isn’t what I signed up for. 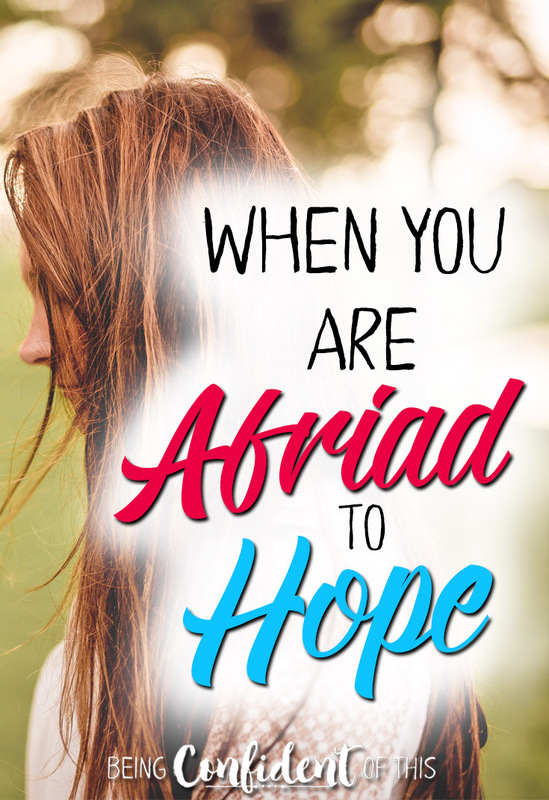 We continued on, struggling in marriage, partially because of his own personal fight with demons from the past and partially because I was believing lies from the Enemy about myself, about him, and about us. I worried a lot about whether we would make it. Sometimes I even longed for the release and relief of a separation. Wouldn’t it be so much easier on my own? But I knew that divorce was a sin. I also knew I didn’t want that life for my children, and I knew that part of me still loved my husband in spite of not feeling the love at the moment, so ultimately we decided to stick it out. And then came Valentine’s Day, a day for celebrating love and marriage. The problem was that I didn’t feel “in love” anymore. In fact, at times I didn’t even like my husband, and I don’t think he liked me very much either. I didn’t want to celebrate Valentine’s Day at all. There are no Valentine’s Day cards that talk about staying committed even though marriage is hard right now. There are no Valentine’s Day cards that talk about how you weep at night, yet you hold onto hope for better days. 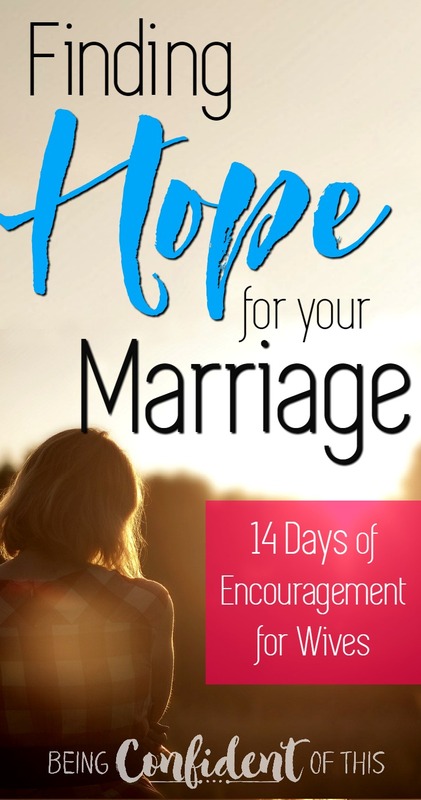 You cannot find a card that demonstrates how much you value your commitment and value your spouse in spit of feeling unhappy, nor cards that express the hope of longing for a healthy marriage. No, those cards don’t exist. What could I do? To buy a sentimental card felt like a lie; it would be dishonest. Finally, I settled on a more general card, then added my own note to it. I wrote about how hard life had been lately for both of us. I wrote how sorry I was for my own failures as a wife. I wrote about what I saw in him when we first fell in love. 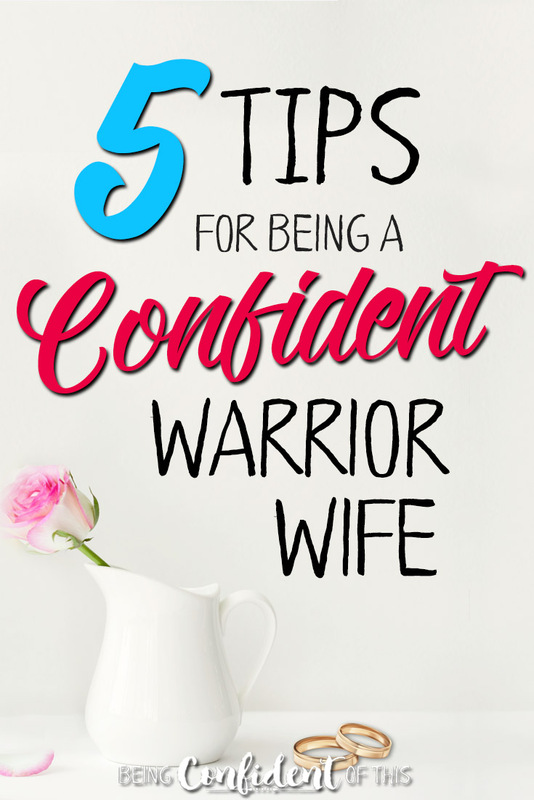 Most importantly, I wrote how I planned to stick by him, for better or for worse, even though marriage seemed so much more than “worse” at the moment. In so many words, I told him I believed in us and I believed in our God. *Being Confident of This makes use of affiliate links. For more information, please visit the home page! My husband still keeps those cards, even the ones from the rough years (yes, years). They mean something to him. They mean something to me, too. We survived that rough Valentine’s Day and some painful anniversaries, too. Although I’d love to tell you we never visited the dark times again in these last 15 years, it would be a lie. We have. 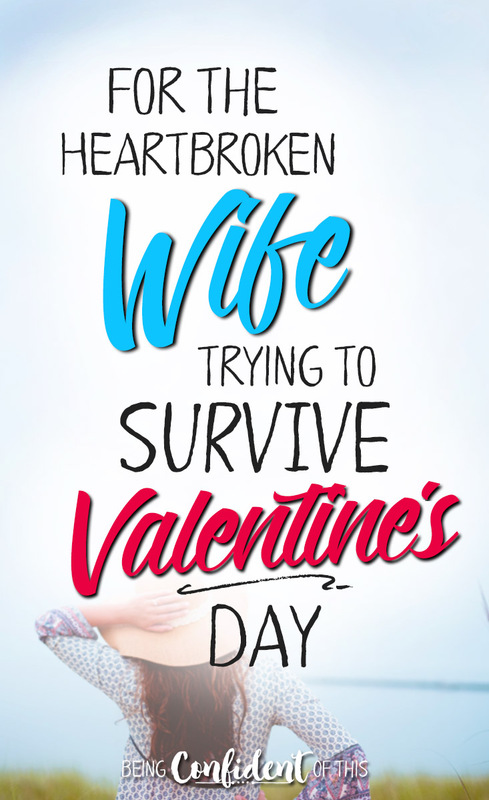 So, this Valentine’s Day, my heart goes out to you, the wife who doesn’t feel like celebrating love, the wife who feels so unloved and maybe even trapped. I know that Valentine’s Day shines a great big spotlight on your source of pain. 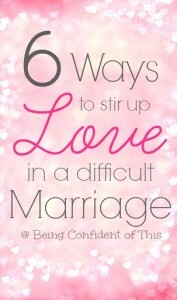 I know you are tired of struggling in marriage and you long for just a small slice of peace in your life. I know you often feel alone in this. And I know the loving feelings just aren’t there at the moment, as much as you wish them to be. Take heart, lonely, wounded wife. You are not alone! The Father has not forgotten you! This is just part of my story of surviving Valentine’s Day when you feel unloved… and unloving. 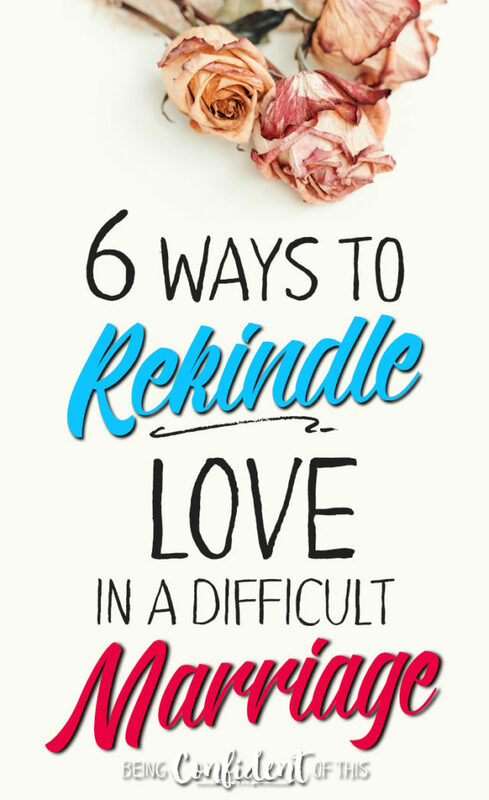 I hope you’ll join us for Part 2 in which I share six practical tips for stirring up love when marriage just plain stinks. 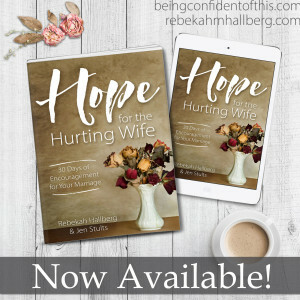 This post is an excerpt from the book, Hope for the Hurting Wife: 30 Days of Encouragement for Your Marriage by Rebekah Hallberg and Jen Stults. 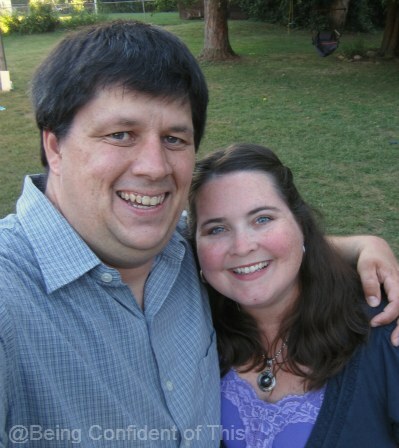 In the spirit of truth-sharing, I’ll tell you that being the wife I am called to be is my weak area, my Achilles heel. I never feel so much like Paul in Romans 7, battling with the flesh, as when marital issues arise. How can I love my husband when I myself feel unloved? Often Satan and sin have me so ensnared that I even become confused as to what “right” really is. Like many married couples, we tend to get caught up in the cycle of an argument that’s been played out time and time again. And that can be so frustrating! Revisiting those same issues makes us feel like failures, trapped by the past, stalled in our progress. But I’m not satisfied with a marriage that’s merely okay, and I mean that in the best of ways, I really do. I desperately want to grow ever closer to the type of intimacy God intended for us to experience as man and wife. I don’t want to be fatalistic or resigned in my outlook, even though I may feel that way at times. Because if I settle for “this is as good as it gets,” then where is my hope in the God who transforms souls, including my own? Marriage is hard work, just like parenting is hard work. If it were easy, we would not be challenged to grow! Marriage teaches me things about myself that I loathe: how selfish I am, how easily offended, how weak and needy. But unless I see the truth of where I stand, what chance do I have to move on from that spot? 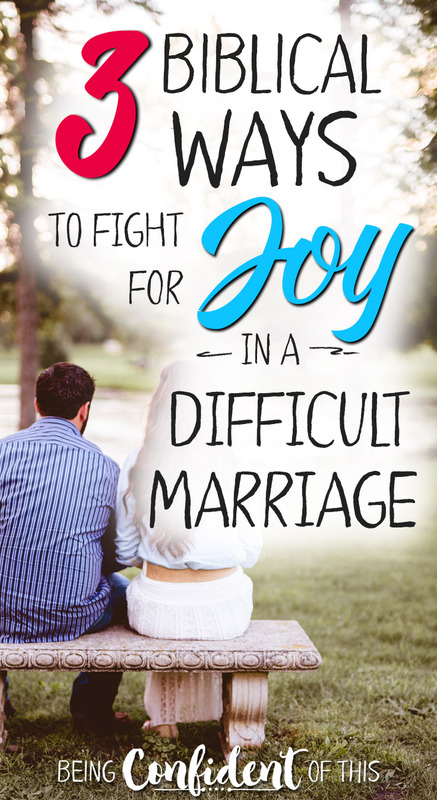 By far the most difficult times in our marriage occur when we are both bearing unusual burdens that slowly wear us down, burdens like extended illness, or financial stress, or parenting issues, or major decisions, or unpredictable catastrophes. We’re both worn and frayed. We’re both longing for rest. You’ve been there before, I’m sure – those times in life when you both feel like you need a good long vacation from reality. As much as I’d like to blame our marital strife on my husband’s inadequacies, I know the issues at hand aren’t his alone. We’re called to be sacrificial in our love for one another, but when I’m already at the end of my rope, I often feel there is nothing left to give. 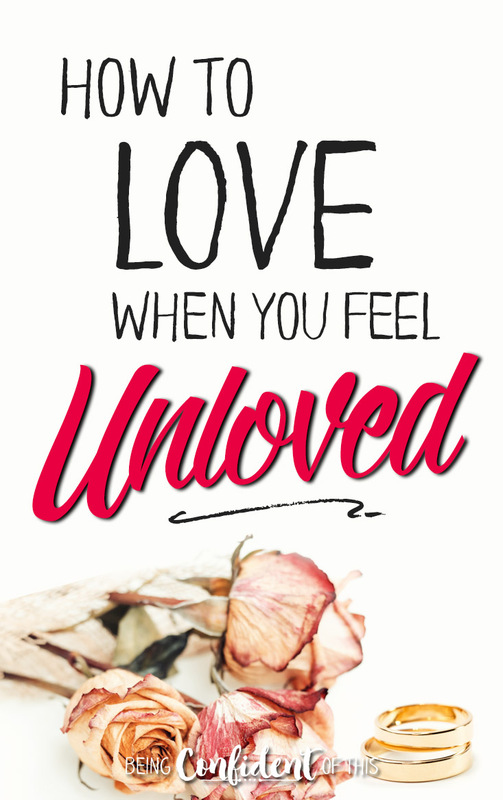 I justify: how can I love when I feel unloved? 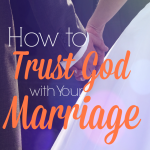 How can I lift my husband up when I can barely lift myself up, Father? 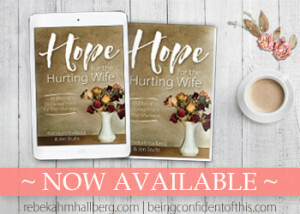 I’m certain I’m not alone in this desire we wives have to be rescued by our husbands when the going gets tough. This desire to have men of strength come charging in to save the day. This desire to let ourselves be the weak ones for once. This desire to feel protected and cherished and cared for. Because for all of our outward strength, we women often harbor needs that remain hidden. The problem is that in wishing my husband would take on that role of Rescuer, I’m asking him to fill a space only our Father God can truly fill. When I ask my husband to fill up that empty space, I’m asking to be disappointed. My husband is imperfect. Sometimes he lets me down, as I do him. Sometimes he needs a Rescuer just as I do. Sometimes he is weak. He is only human after all. My desire for him to be what even I cannot is quite unfair, isn’t it? I’ll be honest. 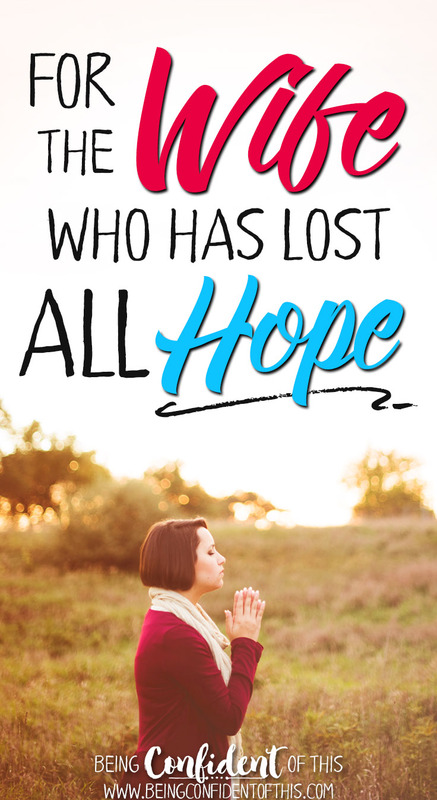 As a busy mom of four, I wrestle with this idea that God should be my sole supply. After all, God cannot help with the bedtime routine or sweep the kitchen or sign permissions slips or pay the bills, at least not in a physical sense. I wrestle, too, with feelings of disappointment and unkind thoughts toward a husband whom I truly wish to respect. So, how can I love my husband when I feel unloved? How can I be so filled with the Spirit, so filled with the Father’s love for my husband, that I have a constant and abundant supply to give? Honestly, I have no clear answers. I have only ideas, inklings of what it takes. Prayer would be a good start – telling God where I’m really at, even if it’s ugly. Letting Him know how unfair it feels, how I feel unloved, how hurt I am, how afraid. Asking Him to bring light to the Enemy’s lies, lies about how it will never change, about how it never has changed, about how you’re stuck. They are Satan’s favorite lies. You’re trapped in this loveless marriage forever! He’s unfair! He doesn’t appreciate you! You shouldn’t have to put up with this! Praying for supernatural intervention certainly helps! 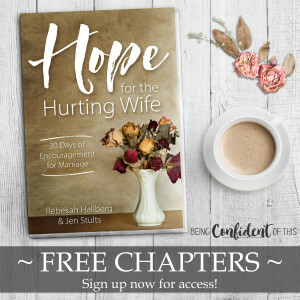 God can change my husband’s heart, as well as my own, quicker than an hours-long “discussion.” He can give me a supernatural love for my man, something that is not naturally “in me,” especially when I feel unloved. The Father can melt my stubbornness, soothe my anger, hold my hurt, and forgive my sin, too. He can also help me see the truth in the situation and who my husband is in the Father’s eyes, a dearly beloved son. He can remind me of how big my husband’s shoes are, how broad his shoulders. He can help me see clearly the load that often sits there and understand why my man sometimes stumbles beneath it. When I see that truth, who my husband really, truly is at heart, I’m overwhelmed by compassion and ashamed by my traitorous thoughts. I may not feel any stronger. I may still desperately need rescuing. I may even carry wounds from the wrestling. But at last I see that we two are the same: lonely, weary hearts in search of love and acceptance and a Rescuer. You want to escape from life right now? Me, too. You feel inadequate? Me, too. Instead of being angry with my hubby for failing to rescue me, we can turn hand in hand to the Father, the One who rescues us both. by gazing into the face of Love Himself. I’m not trying to make it sound simple or easy because I know how difficult it is to choose love when the world tells us it’s easier to give up and call it quits. We can choose to love even when we feel unloved because Jesus did. And so we stand, my husband and I, in the face of Perfect Love. Wearing our Grace-colored glasses because we serve the God of all Hope! We’re merely works in progress here on Earth. And this is not our home. 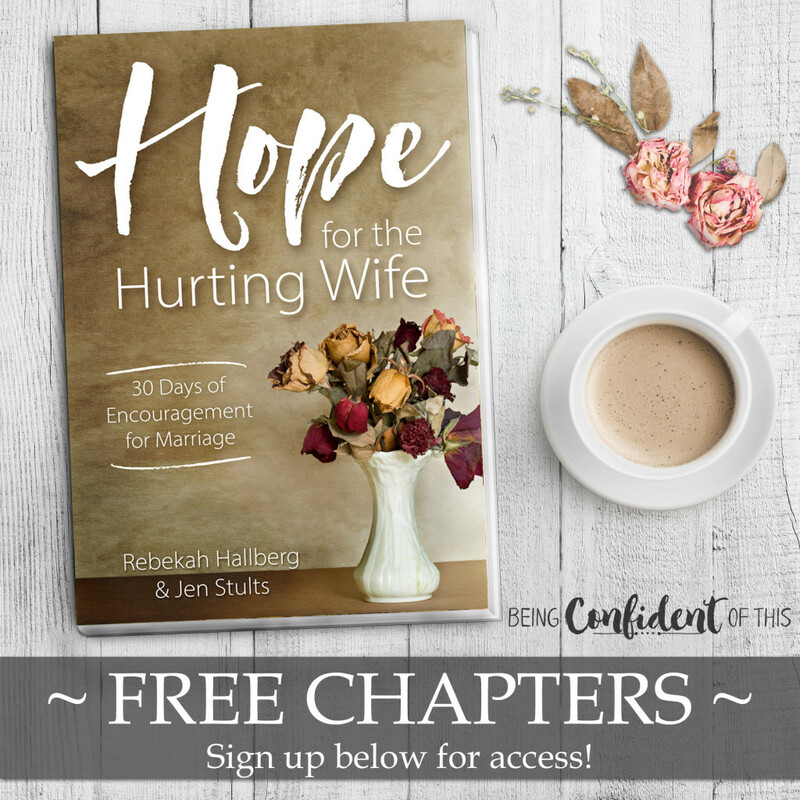 This devotional is an excerpt from the book Hope for the Hurting Wife. Want more of what you just read? Sign up below for more free chapters!